Tonight, while listening to Beck’s Guero, as the song “Hell Yes” played, Amanda asked what the song was. I began to tell her and then stopped, halted by the fact that the name of the song was a swear word. Now, let me say that I’m not really worried about her hearing “hell” but just telling her the name of a song like this plants it in her head as something she can say. I know she has no ill meaning behind her usage of words, just like most people don’t when they use something like “hell,” but I pause at simply telling that to a three year old. It’s just too damn weird. “Daddy, what’s this song called?” she asked again, and I thought for a moment, then stumbled out a brief, “‘Yes,’ it’s called ‘Yes. '” I felt like I’d lied to her. Of all the things that we’ve talked about – Santa, the toys she could get for using the potty properly right now because I know it isn’t going to happen, why things are called what they’re called – leaving “hell” out of this song title bit at me the most. Maybe because I don’t want to be one of those parents, you know the kind – the ones who endlessly, mercilessly censor their childrens’ lives to the point that it’s all bright colors and lollipop and gumballs, yay! But soon it was back to the title at hand, “Daddy, what is this song called?” And just as I was about to try and pass off my edited title again, she blurted out the words: “‘Oh Yes’! Is that what he’s saying?” Yes, yes, that’s it, I happily agreed, just fine to let the computer voice in the song that slurs the “hell” into “oh” take care of my problem for me. It didn’t use to be this easy, you know. It’s almost – almost become acceptable to be as picky as I am in restaurants. For a long time, however, walking into any restaurant and asking for anything “plain” resulted in awkward exchanges or, at worst, meals sent back time and time again. You see, while I have always had to struggle with getting food ordered plain, getting it that way is never really all that hard at fast food restaurants. Years ago, before they actually added “plain” as an option on their registers, it would take some explaining, but once explained, the sandwiches generally came out plain. At restaurants, however, even if the waitstaff explicitly defined PLAIN/DRY on the order, some chefs would define that as “with cheese,” or any number of other condiments that I don’t want anywhere near my mouth or burger. And so it goes that when ordering in a restaurant, it isn’t as simple as saying, “I’d like a hamburger, plain.” No, it has to be, “I’d like a hamburger, plain – dry, nothing on it. Just the meat and the bun.” And then the waiter will ask, “Just the meat and the bun, nothing else?” to which I have to repeat, “Just the meat and the bun, that’s it. Plain and dry.” It’s rarely easier than that. I am fearful of weird things winding up in my foods, so I am very kind and generous to waiters. If something comes out wrong, I resist the urge to get upset, even if it’s the second time that it was wrong, and sometimes if whatever is wrong is minor, I just live with it. I don’t want weird things in my food, and I think you know what I mean. You make someone upset, and you wind up with a little special sauce. Smile, say what is wrong, and repeatedly say, “It’s no big deal,” and live with it. I realize that I am one of the few that places these demands on waiters, so when something comes out not quite right, and I can’t simply eat it that way and have to send it back, I have to make like I’m not upset about it. If I get upset, I will spend the rest of the night worrying that I just ate someone’s snot, feeling around in my mouth for every unusual little thing that I can’t immediately identify. Trust me, there’s enough I already worry about with food as it is. It sounds worse than it really is. Once in a while it is a hassle, but I know, as I stated before, that the world isn’t built for us. I have to make do within the confines of a world made for people who will happily gulp down anything put in front of them. Were it my choice, everyone would have to declare what they want on every meal they order. Really, wouldn’t that kind of be perfect? How many times do you get exactly what you want? You could have it your way. I took a bite from the apple and knew instantly that I was in trouble. Soft. Mushy. Not good. Maybe it was a bad spot. I turned it and took another bite, hoping it was just one bad area and the rest would be fine. It was a good looking apple – shiny, smooth, deliciously red like its name suggested it would be. It was not. More grainy mush inside. Bad . . . for me. I think, however, that most people would probably have been able to eat it just fine. I have issues, you see. I don’t talk about this much and I don’t know why, but as I attempted to eat that apple it crossed my mind: “Why don’t I talk about being a picky eater more often?” I’ve mentioned it before but never really bother to expound on it, and that’s a shame because I’d say that this is one of the bigger issues in my life. I’m extremely picky, Alissa is a confirmed supertaster (I thought I was one too until we took that test.) It’s a big deal. It affects nearly everything in our lives that involves food, and how much of our lives doesn’t involve food? I wanted to eat that apple yesterday, because I like apples . . . basically. But I’m very finicky about the particulars of apples. No bruises. None. That’s very hard to find. Sometimes I have to give in to a few minor divots, but if there’s any kind of soft spot, well, that apple is out. And if I bite in and anything is off, that apple is out. Apples have to be crisp. They need to have that sharp snap. If they’re even remotely mealy inside, I can’t eat it. And a lot of apples are like that. Others are too fragrant, almost flower-like, making my eyes water and my gag-reflex kicks in. I spend a lot of time at the store picking out apples. The thing that boggles people’s minds about this is that I enjoy what I eat the way I eat it. I eat all sandwiches plain. Hamburgers? They consist of meat and bun, no condiments. I frequently eat peanut butter sandwiches – no jelly, no thank you! I even often have spaghetti with no sauce, just some butter, but I happily will eat spaghetti with sauce. I eat a from a limited menu, and that’s okay to me. It would probably drive most people insane, but I don’t really care – most food simply grosses me out. I shouldn’t have to apologize for this, and I don’t, but I also don’t feel like I should feel so self-conscious about it, and sometimes I am. The world is not built for the picky, but that doesn’t mean you all have to gape and stare when we ask for everything on the side. And, trust me, I see it all the time. Just a short while back, Food Network aired a show about picky eating adults (because we know that kids just go through that phase and emerge on the other side as normal eater.) We are out there and there are more of us than you realize. More than that, I have no reason to hide this. The more I talk about it, the more normal it becomes for you, the “normal” eaters out there. It’s one thing for me to sit here knowing what foods are fine and why, but another to get upset when “normal” eaters express disdain at my disinterest in certain foods . . . without explaining why I can’t eat them. I may not be responsible for people’s rude reactions to me, but as Mahatma Ghandi famously said, “Be the change you wish to see in the world.” If I explain my reactions to food, perhaps others will have kinder reactions to all of us. Watching the news this morning, this late-model Pink Floyd song immediately came to mind this morning, just hours before Barack Obama became our 44th, and first African American president. Regardless of your political feelings about the man, it is impossible to ignore the cultural significance of the event. It is huge, and I think it’s pretty cool that my daughters won’t know an America where only white men were president. “On the day the wall came down” indeed. Beyond that, if there’s one thing I hope it’s that out of this comes the “change” everyone backing Obama chanted about last year. If everyone embraces a spirit of simply changing their outlook, things can turn around – because, if everyone’s not aware, most of our biggest issues in this country right now, and I’m talking about the financial crisis, are based solely in people’s minds. If people want change, here it is. Today marks your change. Embrace it and move forward. Fear has gripped us for so long that we can’t move. I pray that Obama’s messages of “hope” and “change” really are carried forward by people and we get this economy moving again. Because that’s really all it takes. People stop taking their money out of their 401k plans out of fear of what could happen, banks stop saying no to lending out of fear of what could happen, and people stop hoarding all their money out of fear of what could happen: if these three things happen, everything will slowly go back to normal. Start investing, start lending, start buying. Yes, you. Maybe it’s not as romantic or dramatic a vision of change as you might imagine with our first African American taking office today, but it’s what our country needs more than anything right now. The racial barriers are coming down, slowly but surely. His win was a major triumph in that regard, but his legacy will only be as meaningful as what he can actually accomplish with the power that has been given to him, not only as president, but as possibly the most significant presidential election in ages. There are very few firsts, and very few are as momentous as this one. I hope in four years to be able to look back and say, “Yeah, he actually did do a great job,” and that one of the first things that happened, albeit tangentially, was the economy turned around. Good luck, Obama, Mr. President. Can I just say that while I’m glad that younger people are reading anything, I’m getting a little tired of seeing people talk about “the books they’ve read” only to see lists of comic books and graphic novels? I know, it doesn’t make me cool to say that, but whatever. The illuminated manuscript is in, I know. Sorry – I consider reading to be, you know, reading, where the book in question contains mostly, if not all, words. Not to belittle the artistic efforts of comic book creators, because I know that requires a lot of work, and they very often have intriguing stories to tell. But there are different actions going on with the reader – a novel/stories requires the writer to do his job in such a way that the reader fills in the details, creating a world around the words, whereas the comic is bolstered by art that supports a minimal amount of textual cues, be it dialogue or narrative in nature. I want to encourage people to read, and if comic books gets them to start doing so, great. Maybe I’m too cynical. I just don’t see it being the gateway drug to reading novels. 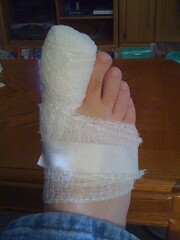 You may recall an incident late last spring when I dropped a big ol’ box on my toe, effectively crushing it. It was annoying, but it healed. Unfortunately, however, like the proverbial stone in water, there are consequences that ripple off one event in unforeseen ways . . . such as a damned ingrown toenail. Now, I admit, it didn’t look all that bad to the untrained eye, but as soon as my foot doctor saw it a couple months back, she said, “That’s going to have to come off, kiddo.” And my stomach sank. I know what the North Vietnamese did to their prisoners. I heard about sticking bamboo shoots under finger nails, and I know how much it hurts to merely pull the nail away from the bed just a bit. No thank you. So I held off hoping it would just magically heal. And then the nail broke, revealing a disgusting, bloody little hole right where my nail was digging in. But then it kind of healed back, but was sore . . . I dealt with it. Until it broke again, and then I had to admit that something was really not right. I gave in and agreed to have it taken care of. Here’s one thing I have learned: when you have something wrong, don’t look it up. Don’t Google it and then read responses on message boards from people who claim they’ve experienced the same thing, or have friends, aunts, or know the dogs of people who have had whatever you’re looking up done. It will serve you not at all to know what these people want to say. You know when you ask someone about something possibly negative, and they go, “Oh yeah, my dad had that!” and proceed to tell you some horror story about it? It’s ten times worse on the internet. They want you to suffer and worry and possibly cancel it until it’s really, really bad. Because that’s what they did. See, something else I learned is that most people wait a really long time to do health-related things and then it’s too late for the simple, easy procedure and they get to experience the really painful, awful, disgusting things, and sometimes they wait so long that it has to be done twice. Infections and whatnot, you know. But I’m digressing. I went to my foot doctor yesterday with visions of infested toes and mangled nails, blood-oozing sores, all set to horrific stories of pain and drawn-out affliction, infection, and other forms of grossness. And it was all for naught. Here’s what happened: I read about this, and didn’t really get it, because I thought people were saying something in a clever way. She froze my toe. And I mean literally froze my toe. It was some kind of extremely cold liquid that she poured onto my toe, numbing it. And it was cold – painfully cold, until it went numb. And then she went in with the needle to numb it. I didn’t feel the first shot at all. Cool. The second one, she repeatedly told me to breathe deep, really deep, and I just wasn’t feeling it . . . until I did, and THEN I breathed REALLY deep. That, dear Readers, was the most pain I would feel the entire time. I heard lots of snipping and cracking – big toenails are kind of grossly thick, you know – and within about 5 minutes, it was done. I was bandaged up and ready to go. Since I obviously couldn’t wear a regular shoe with that, I was given this stylin’ foam shoe. 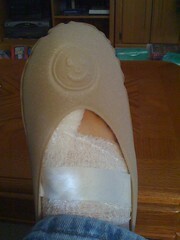 The smiley face is strategically placed over the big-toe area to induce quicker healing, or so I hear. If you are brave, jump on over to the next page for . . . toe revealed! It’s January 12. I’m still coughing crap up from whatever it is that I got a couple days after Christmas. That was a whole year ago! I got cipro running through my system because my doctor said I may have “several things going on,” and it’s killing off every bit of bacteria, bad and good. So far, not too impressed with the cipro. The coughing and stuffy nose: seriously getting old. Danielle is getting big. Big! She’s 6 weeks old and already about to outgrow her bassinet, which Amanda was in for about three months. I’m wondering if she didn’t inherit the “tall” genes in the family – most of us are short, but there are a few freaks among us who tower well into the 6 foot range, including several on my dad’s side of the family, and my older brother-in-law also qualifies. The funny thing is I have no recollection of how big Amanda was, it’s only when others remind me of where she was at this point that I realize that Danielle is growing so quickly. Big eye, big cheeks, and, to entertain us, she makes lots of grunty noises all the time. It is strange, however, how different things are – with Amanda, we had no idea what to expect. Now that we do know from experience, I find I’m anxious to get to those next stages – sitting up, crawling, etc. Do you know how hard it is to find a dresser for kids – an affordable dresser? Amanda needs a new one since the one she’s been using will be making its way into Danielle’s room soon, but we’re stymied by the fact that we can’t find one that isn’t ridiculously expensive. I mean, I don’t want to buy something cheap for my little girl, but I think spending $800-1000 on a small dresser is a bit excessive, don’t you think? I know there’s this whole industry catering to parents who can’t help but buy “nothing but the best” for their kids, but you can’t tell me that the entire market has disappeared for the rest of us, the “nothing but ‘eh, it’s okay,'” crowd, apparently. Or is this another example of the Itunes-ification of American – give them one choice and they have no option but to go along with it? Seriously? Sting, dude, you’re on TV. I am consoling myself over the loss, again, of my old girlfriend, Alyssa Milano, to some shlumpy dude who she could clearly do better than. It’s okay, because Apple has finally given up on both that crappy DRM scheme and is offering upgrades to higher sound quality music. Amazon started selling DRM-free, high-quality mp3s a while back, and it apparently forced Apple’s and the labels’ hands. We’re edging closer to a day when we won’t have to even think about lossy compression of music anymore – it’ll just be high quality lossless stuff. But for now, this is okay. Me, personally . . . well, if you ask, I only have a few things purchased from the Itunes store. Brad Mehldau’s complete Live In Tokyo, as it was originally a sickeningly expensive two-CD Japan-only release and is now out of print . . . except it’s available in its entirety on Itunes, but at the lowly 128kbps quality. Son Volt’s excellent The Search, expanded by 8 songs only on vinyl . . . and on Itunes. And Elbow’s recent exclusive Itunes Live set, which is so excellent – I am assuming Apple will be upgrading their own material, too, right? Alyssa chose the goofy looking dude (seriously, you see this guy?) and I get files. Alissa (coincidence?) understands I may need some time to cope with this. Right, honey? Right? Well, so much for all the positive talk yesterday. I’m right back to feeling awful again today. Great. The great disease infiltration of ’09 continues pretty much unabated. Whereas earlier in the week I was downing dose after dose of a cough medicine designed to put a damper on the activity, I’m now taking something to do the exact opposite, which, as it turns out, is a pretty painful proposition. It also makes sleeping interesting, as midway through the night I awoke feeling as if something was sitting on the right side of my chest. A mildly deep breath resulted in spasms of coughing. Not good. Also of note was last night’s weekly garbage ritual, made exciting by the fact that I couldn’t really take much of a breath, and by the time I was done, I was gasping for air and sweating. Just from taking out the garbage. Part of me remembers a time back in high school when I had pneumonia and thinks “This seems awful familiar!” but I’m not sure it’s quite that severe. That said, I can’t seem to go anywhere – one trip out yesterday, the first in a couple of days, grew extremely uncomfortable. And that was two days ago. I stopped writing for almost two days. Let me tell you, this cold, bug, germ, death, whatever it is, is nasty. I can’t think of the last time I had something that just laid me out like this besides an out-right flu, and I am pretty sure it’s not the flu, because that’s even worse than this. But this has been really bad for about 5 days, and just plain bad for a week. It was never “simple cold” level “okay,” which is sometimes okay because you can keep functioning with a simple cold. Not this. I was down and out. On the sofa doing nothing for days. For example, yesterday I watched seemingly hundreds of videos on VH-1 Classic’s “2009 For 2009” video countdown. Videos I probably wouldn’t ever watch otherwise. Because what else am I going to do? I watched a hilariously Tim & Eric-like commercial for FinallyFast.com (a company that promises to speed up your computer – uh-huh), the hoveround or some similarly entertaining mode of transportation for the elderly, and most frightening/humorous of all, bizarre commercials with “83 year old Tony Curtis,” who has apparently turned into a very old, bald cross-dresser. Not to be mean or anything – I know he’s old, but this commercial is beyond simply odd – it’s weird, creepy, and disturbing. And I saw it a LOT this week. It was either that or Destroyed In Seconds on Discovery – a decidedly LOW-quality, un-Discovery-like show that has me fearing what direction they’re heading now. Just when things were stabilizing with a bunch of shows that were attempting to, badly, mimic the entertainment value of Mythbusters and Dirty Jobs, not to mention the “mind on cruise control” power of the new genre spawned by How It’s Made, they’ve managed to lower the bar. There was a moment there when, after watching a bit of Destroyed In Seconds, Amanda kept chanting, “I want to watch crashes!” where I can see how people turn into bad parents and let their kids get their way. It’s cute, if only for a bit, to see them say stuff like this, but you have to step aside and look at it from another perspective to realize this stuff ain’t for 3 year olds. Cute, and America’s Funniest Home Videos, as it may be ready to hear her chant for destruction, I just couldn’t do it. VH-1 Classic it was. All day long. After all, these were all the videos I grew up watching. And I turned out okay, right? Right? And then this morning I woke up and everything seemed different somehow. I still had a bit of a sore throat, still felt the pain of congestion in my lungs and possessed that deep baritone voice of the very sick, but I felt better. The whole day’s been better. Amanda’s on her way, I think she’s a day or two behind me, so we still have a few days of “MY NOSE IS RUNNING!” and explosive coughing in the middle of the night, but the end is nigh. The interesting thing that I noticed is that, while sick, I had no interest in being on the computer. As evidenced above, I began one paragraph and abandoned it, and that illustrated my computer exposure much of the week besides what little time I spent at work. Today, after a few hours on the computer this morning, I came away from the experience wishing I’d simply taken it easy, resting, reading, watching TV, doing anything but sitting behind this stupid box. Is it getting older? Or am I losing interest in all of this? I don’t know. If I believed in resolutions, one I’d make is to simply not spend so much time on this thing. As it is, I’ll simply say that I hope maybe I’ll keep in mind how I felt this morning after days away from the computer. And now I’m going to go take that advice. I’ve got pasta boiling, sauce cooking, some chicken awaiting cheese and sauce, and fresh, home-made bread baking. That beats the computer any night.